Does anyone remember this? 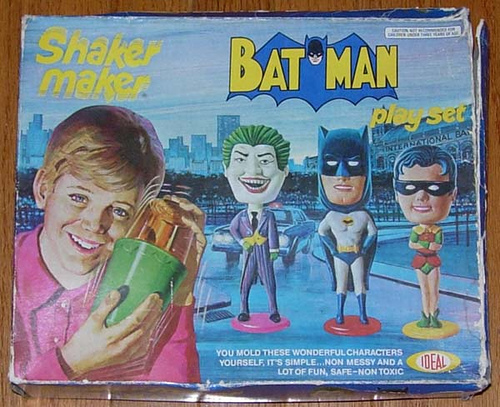 Shaker Maker was a toy from Ideal where you mixed up a pudding-like powder and then shaped up some goofy little figurines, which you would eventually see at every garage sale in town. Apparently they've tried to make comebacks a few times to no avail. Shaker Makers -- truly a toy created by Satan on the Eighth Day!!! I had this as a kid back in the '70s, and its only apparent value was to teach kids the meaning of frustration. The whole problem was that kids don't have the upper body strength to properly shake the mix, so you'd have a crumbly mess most of the time. Even if you could make a good mix, the figures never came out of the molds properly. I remember trying to make my mom a "World's Greatest Mom" trophy for Mother's Day... and ending up in tears. Maybe they fixed these kinks in later versions, but for me, Shaker Makers go down as one of the worst toys ever. Oh, but the smell of the little figures when they came out of the mold! A little slice of heaven! Nearly made a snuffer out of me. It's odd, but I was just thinking about these things (and that smell) today and couldn't remember what they were called.